There ya go. Can't wait to see it! I’ve been thinking about it and think I’m going to ask David to make me a baby bezel stacker ring for my right hand. I could enjoy it more and stack it with other bands! mrs-b and SandyinAnaheim like this. This is the pic I sent to him. I have some skinny diamond bands that would look great with it! I wish this diamond would get here...They couldn’t process payment through PayPal until after New Years Day and then it took them another day to process it. I haven’t received any updates and I’m dying to get it. I hope it’s not dark..and that it looks mostly white with a silvery undertone. I’m actually thinking of it like a fancy colored stone. If it’s pretty I’ll just bezel it and stack it..unless I truly love it and then will have to see what I can do with that size diamond..I was thinking maybe those vintage looking illusion settings.. I love those illusion settings!! I'd like to see the settings you're considering as I'm debating the same thing right now. I can't wait for you to get your stone either!! I have to say - I like this idea better. I wish it would hurry up and arrive! I know! Now I have too much time to worry that it’s too dark.. Worrying is like paying interest on a debt that never comes due. Better to wait in anticipation, there'll be plenty of time to be disappointed if that ends up being the case, no need to start practicing now my dear. Lykame and Mamabean like this. Yes..but Worry seems to be my middle name.. 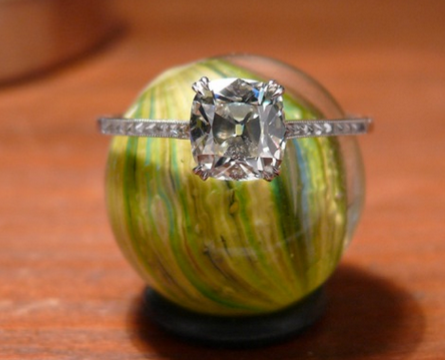 I love it, and I'd do it myself if I wanted to enlarge the look of a specific diamond. I actually love illusion settings; I think most of them are very successful, and I think the one you linked to is fabulous. Looks like a beautiful diamond. Can't wait to see it and what you do with it. Omg..I didn’t even get it and I’m back to the bezel. It’s a small stone so a baby bezel it is..
@Mamabean any update on shipping status?? Yes..It’s taking so long! I had to call them yesterday..They said it was going to ship on the 9th but we’re going to Maryland on Friday..and I wouldn’t be home to sign for it. I had them send it to the local FedEx for pickup. I’m hoping to get it on Monday! WOW @Mamabean that is a gorgeous diamond! I love the color and the way it lights up in the video; just a stunning color! Hope it lands in your hot hands soon so you can share your in-person observations; very eager to hear! PS - I may have stumbled upon its big sister. I just adore the color play in this mamma-jamma! It’s so pretty! You should get it! Don’t think I didn’t wipe some drool off my tablet and hide my wallet! Haha! I hope it’s not dark..I’m still trying to decide how to set it. I may do a bezel but I may want to pop it out if I live with it and not enjoy it so I can replace it..I may do a mock bezel with prongs but tiny ones because the stone is small. It will definitely be stacked..so that’s why I was thinking a bezel. Any suggestions are very welcome! M is for magnificent and marvelous and Mmm mmm good. And M is also for @Mamabean of course.